Autonomous cars are coming — How will they change what businesses offer? Say goodbye to brick-and-mortar, and say hello to wheels-and-rotors! Brick-and-mortar and digital commerce won’t be the only ways to purchase products and services for long. Enter a whole new selling floor: the automobile. Businesses should prepare to embrace the autonomous vehicle (AV) as the most transformative Internet of Things (IoT) product ever developed — and the next place to sell to consumers. These vehicles will drive a whole new economy of products and services, meeting passenger needs via in-vehicle marketplaces. Businesses across all industries should consider ramping up now. Despite ubiquitous naysayers, world renowned research giant McKinsey & Company predicts that by 2020, consumers will begin adopting autonomous cars. They foresee that, just 30 years later in 2050, AVs will become the primary means of transportation. These predictions aren’t hard to believe, with multiple organizations working hard to take the driving out of driving. GM, Ford and Honda all have AV programs in place. Uber’s fleet of self-driving Volvo SUVs already chauffeurs passengers in both Tempe and Pittsburgh. A crash last spring sidelined these efforts, but only for a few days. McKinsey & Company believe that once AVs are the transportation norm, vehicle crashes will actually drop by 90%. It’s time for businesses to move past wondering if autonomous vehicles will be the future, and start thinking about how they can position themselves to succeed and innovate in the new in-car economy. Initially, industrial fleets will have the most reason to switch to AVs. These vehicles are already in use in mining, because they have the significant advantage of operating on private land rather than public highways. Soon, AVs will spread to the construction, warehousing and trucking industries. AVs can help save these companies in labor costs, and the potential reduction in carbon dioxide (due to the potential fleets of electric autonomous vehicles) could help them avoid expensive fines. This will create a gold mine of opportunities for innovative businesses. In each of these niches, companies will need software to track vehicle location, fuel usage, efficiencies and more. Companies will seek to equip their excavators, forklifts and loaders with AV software that measures weight, balance and force. Other software may help to avoid ditches, wet spots and gopher holes — all of which can damage expensive machinery. Users browsing the web are accustomed to seeing ads for related products on their favorite sites. Google Maps even offers a paid solution for restaurants and shops to show their locations on the routes that drivers use get to a destination. Similarly, as travelers sit back and relax in an AV on their commute to work, advertising messages may appear on a console or an interface that entertains them or facilitates work. Businesses, meet your new way to reach targeted audiences. Consider tasks consumers can do while spending an hour or two in an autonomous vehicle during a commute. Restaurants could provide take-out meals to eat in the car while driving to a show a city away. In-car dining would require specific food and utensil delivery, which would need to include appropriate plates and lap-tables. Imagine showers (another time-consuming activity) installed in vehicles so that consumers could spend a day at the beach and then go right to the theater with no inconvenient stop at home in between. Finally, entertainment companies will be chomping at the bit to get in front of consumers in an AV; the ultimate captive audience. Riders in autonomous vehicles will have nowhere to go, very little else to do, and companies will know exactly how long their drive should take. We foresee a stampede of companies integrating gaming and other entertainment with travel. There’s no limit to the number and types of solutions that will be needed in a world where consumers can do nearly anything they want during the commute from point A to point B. With less people driving themselves, insurance companies may need to shift their target audience from consumers to large OEMs. Manufacturers could take on liability in the case of a crash, especially given the prospect that accidents are expected to drop by 90%. The insurance space could consider just how auto companies would need to use sensors and software. These programs could send car and even driver information to manufacturers to reduce accidents and the need for repairs. Companies driven to serve the public should look into how government and other organizations will want to harness AVs. A government organization may seek software for its own AV to collect data such as barometric pressure, temperature, traffic, road and bridge repair issues, neighborhood policing and more. Equipped with video relaying systems, cars will be able to document crimes in progress. What other ways can autonomous vehicles become useful in public service? The AV marketplace is coming, despite some kinks that still need to be ironed out. 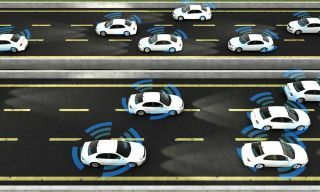 Roadblocks facing autonomous cars (such as legal questions about who is responsible in cases of accidents) could put widespread AV adoption out about ten years. Cybersecurity experts worry about connected cars being hacked and creating crises on highways. Most agree that, before we start regularly seeing autonomous cars at the frequency we see Priuses now, engineers may need a good 7 - 10 years to work out bugs and safety issues. Before AVs become widespread, the government would need to create a smart infrastructure including sensors on roads, median strips and more. This is actually good news for businesses. Most will have to study up to get the context for the solutions we create. That can take a few years. Getting to the marketplace first with your service for AVs will make you a market leader. The vigilance you invest today will pay off down that sensor-studded road, so start preparing for the autonomous car economy now.